Viruses have driven the evolution of all living things. It has now become clear that viruses play a crucial role in chronic respiratory diseases such as asthma. The relationship between virus and man is fascinating and understanding the complexities of this relationship, particularly in the context of diseases such as asthma, and this is what inspired me to get into research. Preventing asthma attacks in children by targeting the virus that causes the majority of these attacks - rhinovirus (the common cold). School age children are particularly susceptible to rhinovirus infections. My goal is to provide new insight into how these viruses cause asthma attacks. My future focus will be to combine the expertise gained working abroad with the world-class respiratory research being conducted at the HMRI to make new discoveries that will substantially reduce the impact of virus-induced asthma and COPD exacerbations. Associate Professor Bartlett is a viral immunologist with 15 years teaching and research experience, firstly within the Section of Virology and more recently within the Airway Disease Infection Section, Faculty of Medicine, Imperial College London. He recently returned to Australia and accepted an academic appointment at the University of Newcastle to set up a research group at HMRI investigating the viral causes of asthma attacks. His ongoing, long-standing interest in immune mechanisms underpinning disease pathogenesis in host-virus interaction began with his PhD and continued through his first Post Doctoral position at the University of Oxford where he studied vaccinia virus host immune evasion. This experience gave him an excellent grounding (and passion) in viral immunology and paved the way for him to develop his career researching the role of viral infections in asthma and COPD. 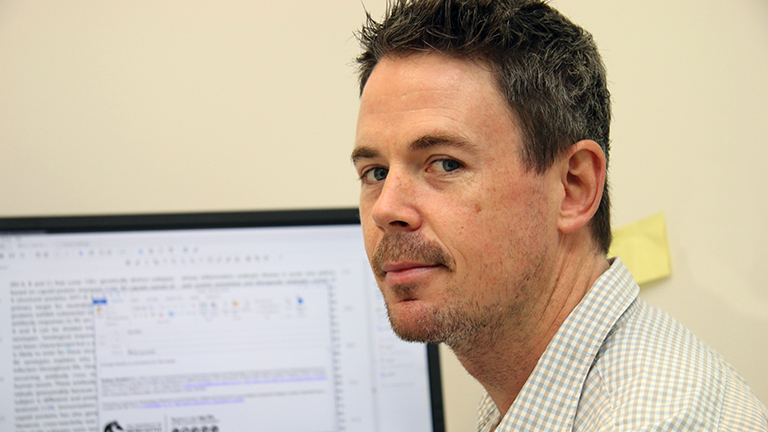 Associate Professor Bartlett works closely with pharmacologists (academic and industry) employing drugs to investigate molecular mechanisms in anti-viral immunity and assess therapeutic efficacy of novel drugs in in vivo infection disease models. He has published 33 peer-reviewed journal articles and three book chapters. Of particular interest is a report describing a model of rhinovirus infection and exacerbation of allergic airways disease which generated an immense amount of interest within the media, academia and industry. Importantly, this publication initiated a collaboration between his group at Imperial College London and the University of Newcastle researchers at HMRI. Associate Professor Bartlett was instrumental in transferring these models to Newcastle where they are now an essential tool that continue to contribute to new publications for HMRI researchers. Now based at HMRI, Associate Professor Bartlett is perfectly placed to utilise these models in conjunction with human clinical models to conduct cutting edge research into the viral causes of asthma attacks. Associate Professor Bartlett is regularly invited to speak at national and international meetings. He has been the recipient of numerous prizes including the Thoracic Society of Australia and NZ travel award, the University of Newcastle DVCR International Visitor Award, the Imperial College/ Welcome Trust Value in People Award.